Salon: BAD ART/GOOD ART Sept 19 7:00 p.m.
Tonight, a thought provoking discussion on the much discussed, always fun debate. P.S. Please bring your own examples too!! September 19, 2012 7-8:30 p.m.
Painterly Visions Blog will no longer be posting with any frequency. I will be concentrating future blogging at Marchand Studio News http://marchandstudionewsletter.blogspot.com/. Come over and visit me there. I'd like to thank my readers for their attention over the past eight years. When I first started blogging in 2005, it was a relatively new phenomenon. My mission was to create a news stream for art happenings in the Washington, DC area to compensate for the lack of news media coverage in the arts at the time. 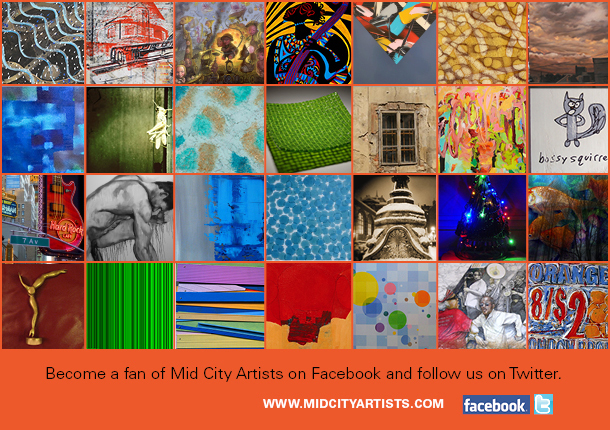 Painterly Visions helped fill a void and joined new voices getting the word out about our city's exciting art scene. The web is a rich source for communication, with the advent of facebook and twitter along with other bloggers, there is a wealth of information about the art scene available online. My favorites sites, Pink Line Project and Daily Campello News still bring news of the arts to your screen. Check the blogroll for additional sites that may be of interest. Thank you for the opportunity to connect over the years. It's been a pure labor of love to deliver news about a subject that is so vital and alive. To the artists; keep creating your truth. 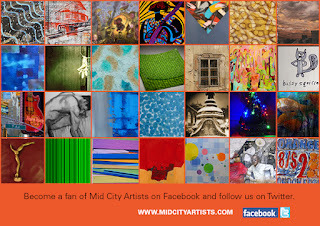 To the art lovers; keep returning to DC for more. Happy creating! This controversial book explores what the author calls a “violence of God” tradition which he claims exists in the world’s major religions, even Buddhism. It then examines how this dynamic is turned on its head by political leaders in the United States and other countries, who use spiritual and religious language to sell war to their populations. The stability of war as a central facet of society is undeniable. During the 5600 years of recorded history, 14,600 wars have been fought. At the same time, the vast majority of people and societies throughout human time have considered themselves deeply religious. An article in The Washington Post noted that “92 percent [of Americans] believe in God or a universal spirit — including one in five of those who call themselves atheists.” At the same time, however, America has been involved in an unbroken line of military engagements since my birth in 1963, whose dead might count out the minutes that I have lived in the course of nearly 50 years. It was this pairing in contemporary America of war and religion, spirituality and destruction that inspired me to write this book. After all, shouldn’t the one (religion) mitigate the other (institutional violence)? This book explores the fusion of war and religion throughout history, and then applies the historical knowledge to the contemporary United States. Block reviews specific instances of “holy war” as proposed in the holy books of the major faiths, and illustrates how bellicose, war-like language is used repeatedly to explain and sanction violence as a spiritual quest. He proposes that this intermingling of war and spirituality is employed to prepare the population for the coming of war. In his view, war as spiritual practice appears inevitable, due to this religio-violent education which is woven through all of the principal faith traditions. In the end, Block asks if God and war define the American spirit as much as apple pie and baseball. Thomas Block’s nonfiction book, “Shalom/Salaam: A Story of a Mystical Fraternity,” was published in the United States (Fons Vitae, Louisville, KY) and Turkey (Bilim + Gonul, Istanbul) in 2010. His first novel, The Fool Returns, will be published in Turkey in 2012 (Bilim + Gonul, Istanbul). His first play, White Noise, was produced in Washington D.C. by Wanderlust Theater Company in June 2012. Tom Block—artist, poet, playwright, and activist—channels all of his roles in his series, “In the Garden of the Mystical Redoubt.” His form of Neo- expressionism, which incorporates raw energy, art brut, and graphic design, belies a sensitivity to the multitudes of the human condition. Whether through black and white portraiture, abstract mixed-media collage, or text-based work, Mr. Block aims to garner empathy for his subjects who embody the idiosyncrasies and tendencies of humans which are at the same time unique and universal. From the angst of “Suburban Boy” to the exuberance of the “Rock and Roll Mystic,” Mr. Block conveys a range of emotional states which remain essential to his work. Micheline Klagsbrun finds the inspiration for the “mythological realism” of her exquisitely rendered drawings from the classical Greek poet Ovid and his Metamorphosis. Micheline is enchanted by the poem’s traditional themes of identity and change, as well as its surprisingly modern relevance to human rights, feminism and environmentalism. Micheline empathizes with the conflicts faced by the classical figures, whose physical transformations represent the universal human struggle for identity, stability, and peace. 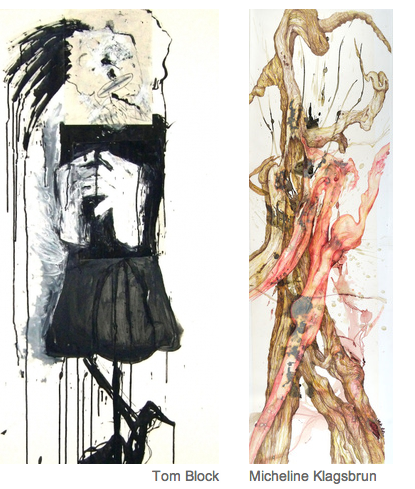 Each drawing is based on a live model, whose pathos is shaped by the narrative of a corresponding poem. Series such as “Lotus/Dryope” (in which a young mother is transformed into a tree) are exemplary of her entire body of work and its anthropomorphic motifs. Wine reception, light fare and dessert. Free parking. 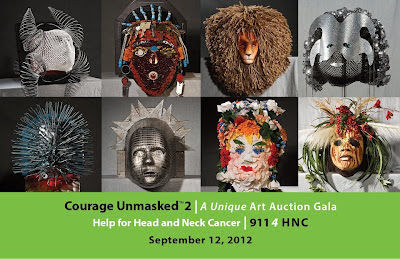 Please join 911 4 HNC for a unique gala event featuring a silent and live auction to raise money and awareness for head and neck cancer (HNC). 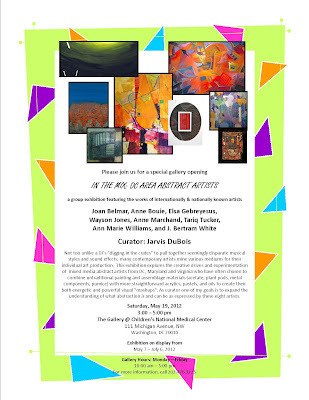 Help support this worthy cause by attending this fun and whimsical art event. You'll love the art this year, some created by well known area artists and artists nationally. Come see! Tickets are on sale now! Purchase at the link below. More than 50 artists from all over the country created fine art by transforming radiation masks formally worn by HNC patients to position and immobilize their heads during treatment. These unique masterpieces will be auctioned at the Gala. 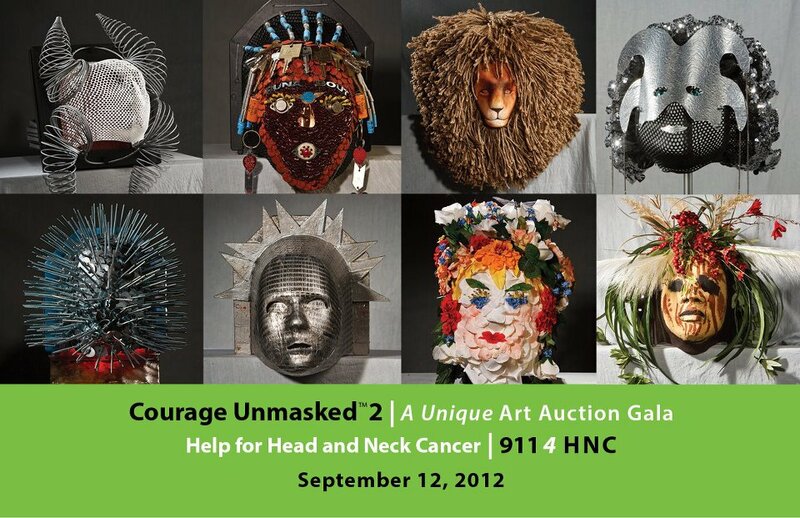 Money from mask sales and admissions will fund 9114 HNC, dedicated to helping those in financial need during and after treatment. "Painterly Visions" will be on sabbatical for the summer months. There will be no posts in July and August, so the artist can devote herself to timely creative projects. Have a happy summer! 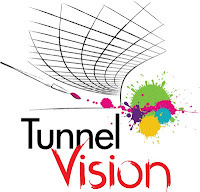 For your reading pleasure and art happening updates, check out Lenny Campello's blog, Daily Campello News and the Pink Line Project, where you will find many exciting art events to entice you through the summer. On July 14, Dutch artist Charlotte Dumas presents her first solo museum exhibition in Charlotte Dumas: Anima – the latest exhibition in the NOW at the Corcoran series – featuring a commissioned series of portraits of the majestic burial horses of Arlington National Cemetery. Dumas, who travels the world making evocative formal portraits of animals, typically works in series and portrays animals characterized by their utility, social function, or relation to people. The exhibition curator is Frank H. Goodyear III, associate curator of photographs at the National Portrait Gallery. The exhibition focuses not only on Amelia Earhart's career as a female pilot, but also on her role as a woman’s rights activist. She was a prolific writer and proponent of women in the workforce and some of her writing is on display—she contributed to Cosmopolitan and wrote several books. The objects in the exhibition are portraits (mostly photographs), a sampling of her writing, artifacts associated with her flying experience and an A/V kiosk, which includes audio of Amelia talking about a flight. 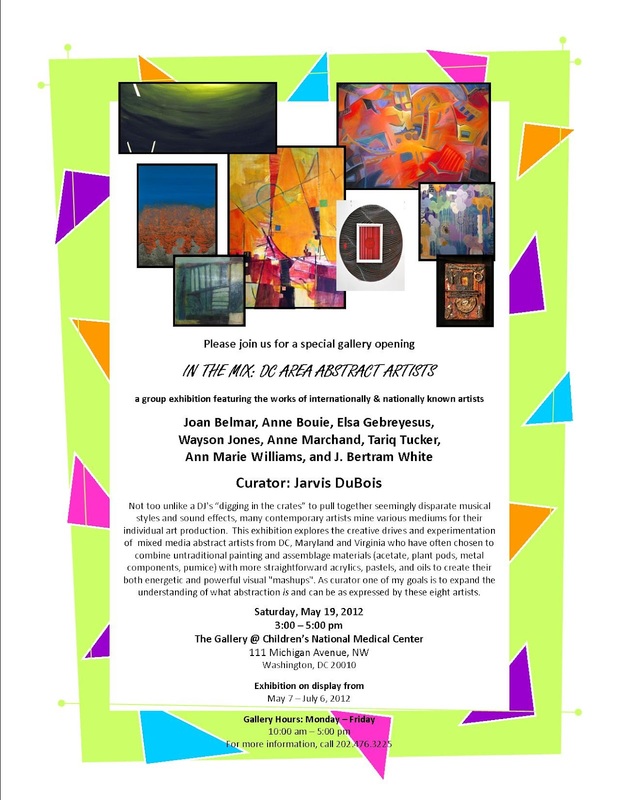 XL-XS is sponsored and curated by Maryland Federation of Art and Circle Gallery of Annapolis. 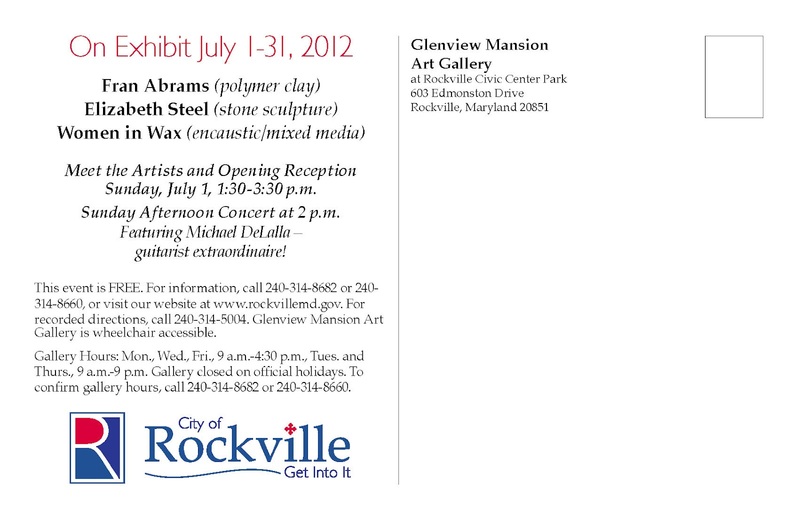 Opening reception Friday, June 29 from 6-8 pm. An eclectic group of artists, including Foundry Gallery members and guest artists, presents a diverse collection of bold, graphic paintings that combine organic elements and urban sensibilities. 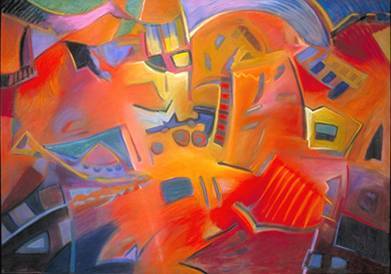 The distinctive use of color, pattern, and light in each work comes together to create an interactive, visual fusion that mimics the energy of improvised jazz music. Like musical riffs, the paintings call and respond to each other, producing a rythmic harmony that is both joyful and dark. 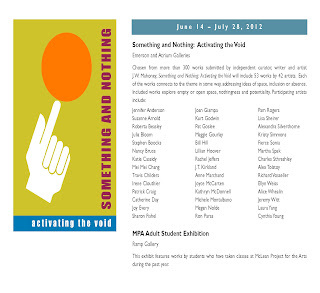 The last day to view Foon Sham's exhibition is Saturday June 23, 2012. 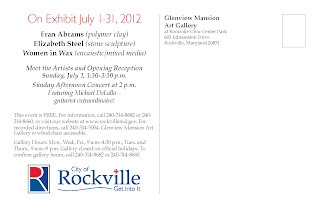 Sham will be in the gallery on Saturday to speak with gallery visitors about his work. Rob McDonald uses a primitive hand-held camera to capture the personal spaces and landscapes of writers from the American South, from James Agee to William Faulkner to Zora Neale Hurston. Native Ground is an exploration of the role place plays in shaping the literary imagination. In coordination with McDonald's photographs, the Athenaeum will feature typographic interpretations of the writers' works by ten of the region's best graphic designers. Designers include: John Foster, Jason Gottlieb, Gerry Greaney, Francheska Guerrero, Dave Plunkert, Polygraph, Scout, Carolyn Sewell, Matt Wahl, and David Whitmore. McDonald teaches American literature at the Virginia Military Institute in Lexington, Virginia, and is a self-taught photographer. 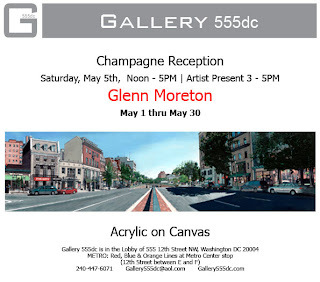 He is represented by the Kathleen Ewing Gallery in Washington, DC. Special related event Saturday, 23rd June at 4pm: Gallery talk with Kenneth Baker, Chief Art Critic of the San Francisco Chronicle; Jack Rutberg, director of Jack Rutberg Fine Arts in Los Angeles; and Peter Selz, Art Historian and curator. Civilian Art Projects presents three new exhibitions, including a multi-channel sound work from Richard Chartier and photographs from Bridget Sue Lambert and Shamus Ian Fatzinger. 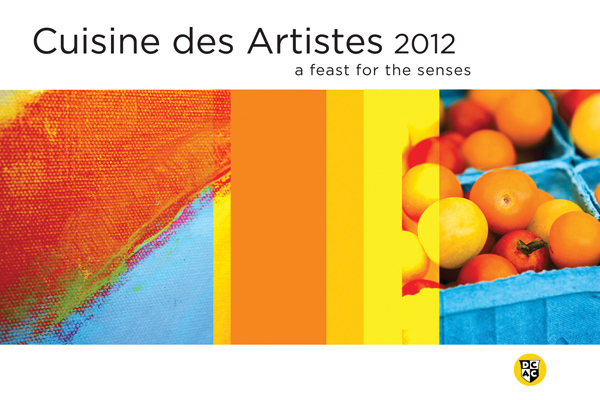 The exhibitions will open to the public on Friday, June 22, 2012 and will be on view through July 28, 2012. A pivotal figure in the history of modern painting, Richard Diebenkorn (1922–1993) was an innovator whose work inspired legions of artists and greatly advanced the lexicon of abstraction. The Corcoran is the only East Coast venue for Richard Diebenkorn: The Ocean Park Series, the first major museum exhibition to focus on the artist's most celebrated body of work. The exhibition features more than 80 works, including large-scale paintings, smaller paintings made on cigar box lids, mixed-media drawings on paper, monotypes, and prints. Sculpture Now 2012 describes contemporary experience through three-dimensions. 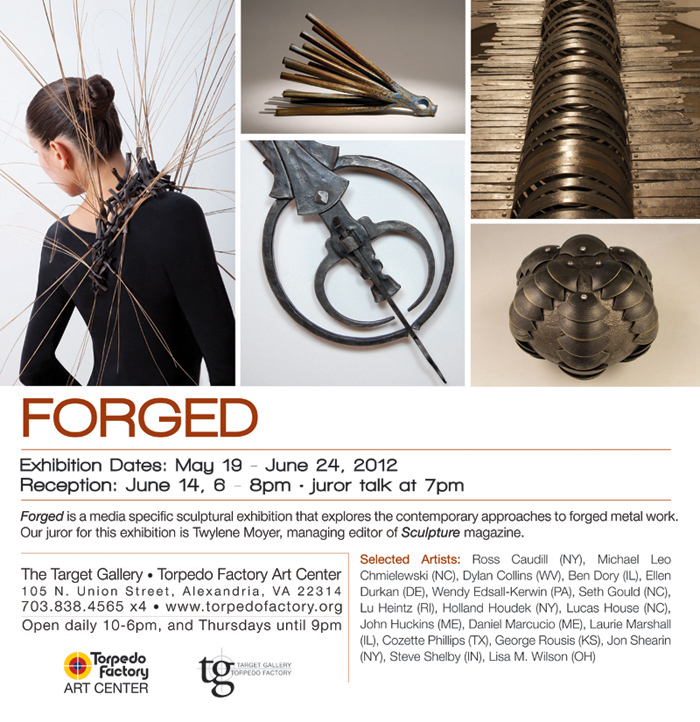 Reflecting the diversity of our time, this show hosts an array of artists who use a variety of materials to express personal viewpoints and philosophies that characterize the things we believe and do. Unable to settle on a single unified vision, these contemporary sculptors opt for a variety of strategies to interpret the world in which we live. Sculpture NOW 2012 is funded in part by the DC Commission on the Arts and Humanities, an agency supported in part by the National Endowment for the Arts. Gallery West announces a call for entries for its 4th Annual Power of Color juried show. 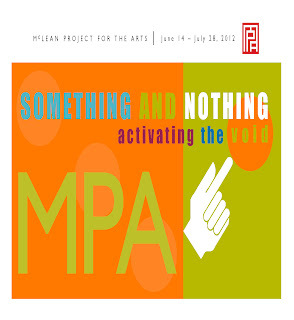 The show will be juried from artwork delivered to Gallery West, 1213 King Street, Old Town, Alexandria, VA, Sunday, August 5, 2012, 12-6pm, and is open to all Washington DC metropolitan artists over 18. The innovative Capital Fringe Festival returns for its lucky number seven year of offbeat theatre, out of the ordinary music and groundbreaking performances, brought to you by the greater creative conscious of Washington, DC. The Fringe begins July 12 and runs through the 29, taking place in over fifteen different venues in downtown DC. This year’s offerings range from one act plays, comedies, musicals, dramas and dance to puppetry, improvisation, clowns, hip-hop, poetry, mime and more. In addition, much merriment and revelry is to be had at the Baldacchino Gypsy Tent Bar at Fort Fringe, where viewers and fanatics alike can enjoy food, drinks, entertainment, and catch the latest buzz about all of the Fringe performances. The Baldacchino opens in advance of the festival on June 18. 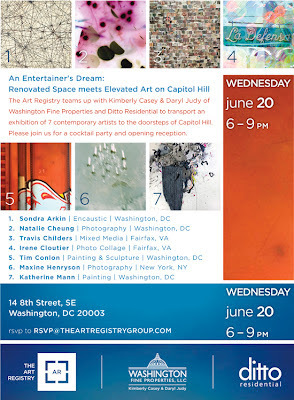 I visited the beautiful airy gallery and frame shop of owner/artist Regina Miele on 14th Street NW, DC yesterday. The Boys Be Good exhibition, DEBITUM NATURAE, explores growth and decay, loosely translated, means "the debt of nature". A life is spent in repayment to that which brought it forth. Gallery open Wednesday - Saturday, 11-6pm or by appointment. Reserve seats now or pre-order the zine! The night of performances, and zine launch benefits the It Gets Better Project. Eve Stockton’s woodcuts are inspired by close observation of nature and an eclectic interest in science. Utilizing a multifaceted background in architecture and art, Eve is able to engage the variables of printmaking, allowing her to produce an ongoing body of dynamic, graphic images. The Ensembles: Landscapes in Transition III exhibit contains prints that are exemplary of Stockton’s ongoing investigation of the natural world. Raw, outsider, primitive, naïve, fringe, uninhibited, intuitive, marginal, fantastical, untrained... These are all words that have been used to classify and define visionary art, yet the term still continues to be just as enigmatic and varied as the art it encapsulates. Unlike all other art genres, visionary art, sometimes interchangeable with outsider art, can neither be defined simply as one movement set in time nor spelled out in convenient academic terms, rather it is truly only understood when experienced and witnessed first-hand. Two of the nation's experts in visionary art - Rebecca Hoffberger, founder & director of the American Visionary Art Museum, & Mary Ellen 'Dolly' Vehlow, curator and owner of Gallery O on H will share their personal stories working with visionary artists, and reflect on the art form's powerful healing ability to move both viewer and artist through personal loss and tragedy. Bob Benson, the creator of the Blinged-Out Universal Tree of Life at Baltimore's American Visionary ArtsMuseum, leads 2 workshops where you will learn to make your own FLASHIES: dynamic, sparkling decorations made from mirrors and marbles. You will leave with 2 finished FLASHIES, to keep, dangle, and adorn your home or garden with. No artistic talent or experience is required; just bring your raw creativity. Villareal’s latest body of work enacts formal inquiries into imagery closely identified with modernity, reimagining colors and forms in the works of post-painterly abstractionists Frank Stella, Kenneth Noland, and Ellsworth Kelly. Villareal introduces temporal actions of light into traditional abstract imaging, using LEDs (light emitting diodes), custom software and sequencing. With these new media the artist explores, in single digital sculptures, extensive frameworks produced in serial paintings, such as the colorful concentric squares in Frank Stella’s Scramble series. Villareal activates familiar static forms, changing their color, definition, intensity, and duration. 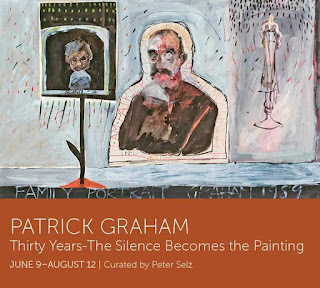 His imagery unfolds gradually, as if revealing the live application of pigments, a process that color painters of the 1950s and 60s concealed in their canvases. 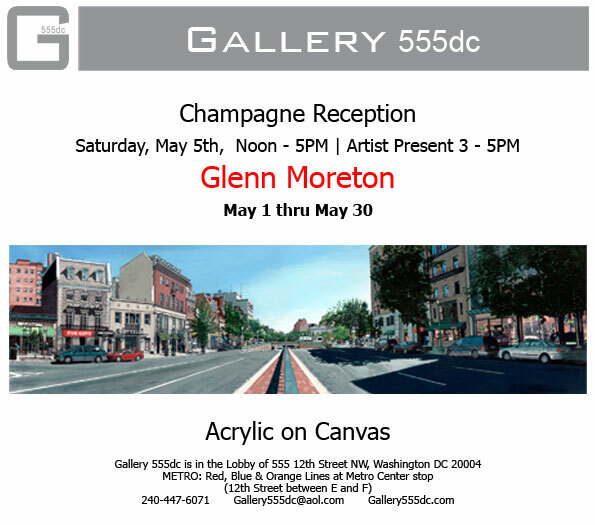 Conner Contemporary Art is located at 1358 Florida Avenue, NE –Washington, DC 20002 in the Historic Atlas/H Street Area. 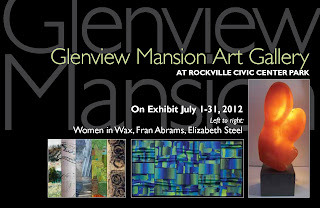 Gallery hours are Wednesday - Saturday 10-5pm and by appointment. 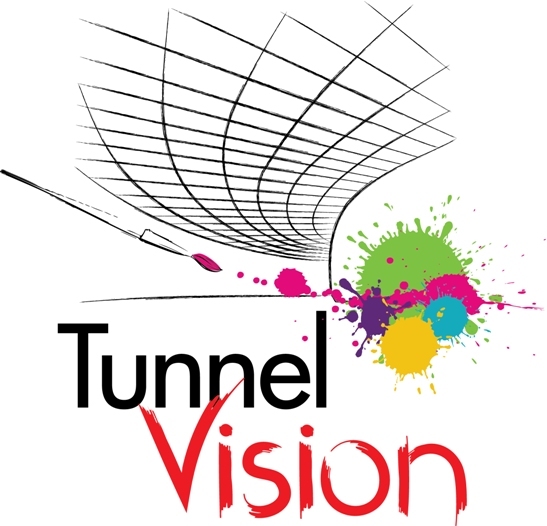 ART Options partners with Providence Opticians to bring you Inner Vision, a collection of paintings and mixed medium representing vision and sight. Gallery opening celebrates community partnership and artistic expression. Join the AU Museum director and curator Jack Rasmussen and exhibition curators Carlos Basualdo and Mónica Amor for a discussion of "Mexico: Expected/Unexpected." Carlos Basualdo is the Keith L. and Katherine Sachs curator of contemporary art at the Philadelphia Museum of Art and Mónica Amor is an independent curator, lecturer and writer. This exhibition, juried by J. W. Mahoney brings together artists whose work deals with space, inclusion or absence. Many artists pay close attention to the “negative space” in their work, and often what is not included or that which is in-between is just as important as what is. Zeitgeist III: Too Much Information? Experience 16 artists' responses to the increasing streams of information coming to us from an ever-growing array of devices and directions. Zeitgeist III: Too Much Information? is the third in a series of periodic group exhibitions of visual artists exploring contemporary cultural themes curated by Ellyn Weiss and Sondra Arkin. 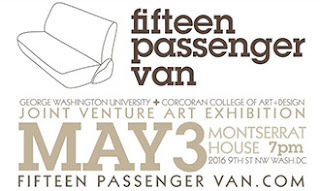 Presented are the works of artists JS Adams, Tom Block, Scott G. Brooks, Richard Dana, Anna U. Davis, Thomas Drymon, Adam Dwight, Claudia Aziza Gibson-Hunter, Pat Goslee, Michelle Lisa Herman, Ryan Hoover, Michael Iocovone, Elizabeth Morisette, Michael Platt & Carol Beane, M.V. Jantzen and Ruth Trevarrow. 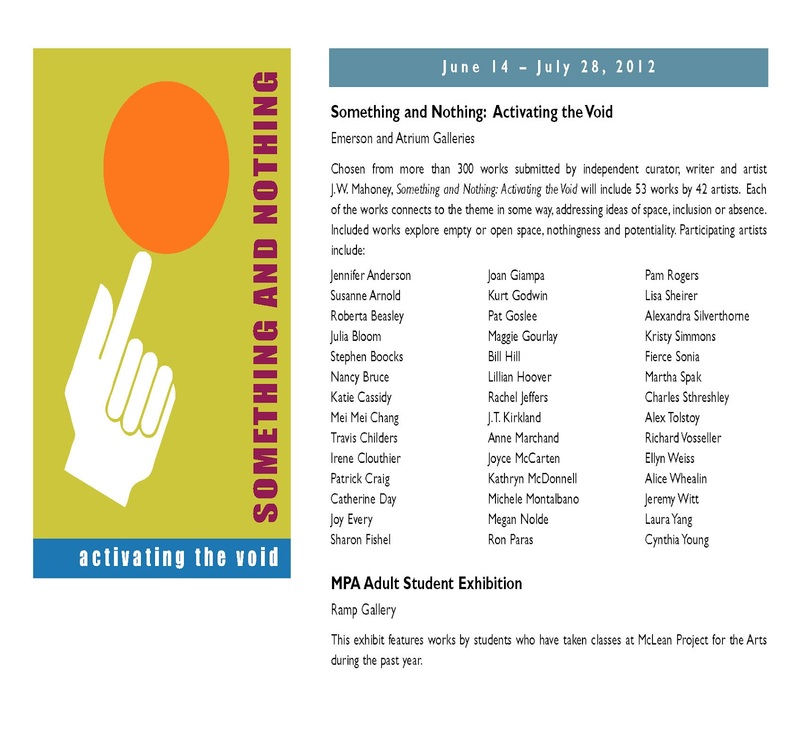 Curatorial assistance by Amanda Jiron - Murphy. In his second solo exhibition with Project 4, Sham furthers his investigation of the materiality of wood, now turning his focus to the self-made remains: sawdust. For Sham, sawdust is the evidence of his hard work, relics from the creation of numerous sculptures. These cherished remnants inspired the concept for a site-specific installation that will fill the first floor of the gallery and spill outside to the courtyard. Part of this exhibition was made possible by a Franz and Virginia Bader Fund grant awarded to Foon Sham in 2010. I built this for you will combine Megan Mueller's interests in both sculpture and drawing to create abstracted works of landscapes and natural forms. Mueller’s work suggests a connection to the land and exploration, place and memory, alongside a technical interest in mark-making and repetitive gestures. Her creative process is intuitive rather than pre-determined and mapped. 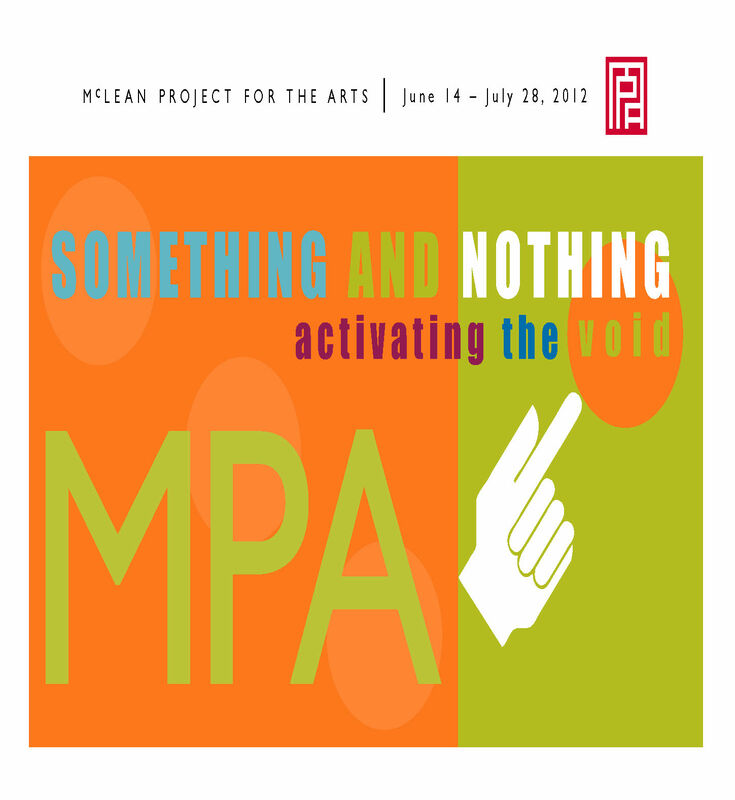 Play and experimentation are at the crux of her practice and Mueller responds to works as they evolve organically.